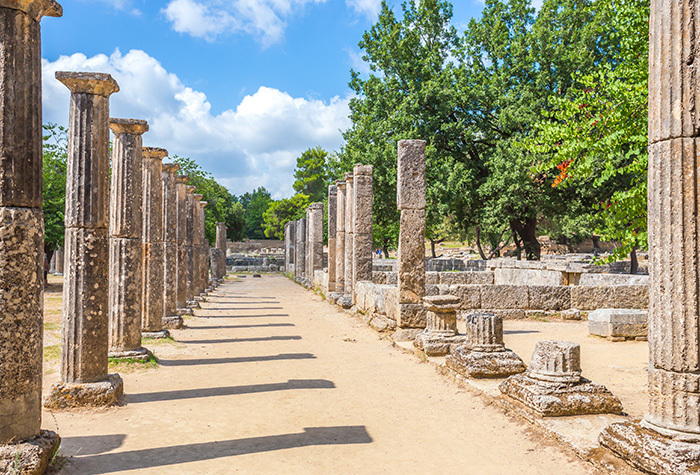 During classical times Olympia was the city of ilia best known as the area where the Olympic games took place, the greatest athletic event of the then-Greek world. Today Ancient Olympia is a village and a municipality of ilia, built in the valley of river Alpheus. Nearby lies the archaeological site, one of the most popular ones in Greece, which attracts every year tourists from all over the world. At the centre of the archaeological site stands Altis, the holy grove, which encompasses the most important buildings. The area is dominated by the majestic temple of Zeus, one of the site’s most significant monuments, since it is the largest temple in the Peloponnese; it also hosted the splendid gold and ivory statue of Zeus, 13 m. tall, made by the sculptor Phidias sometime around 430 B.C. This statue was regarded as one of the Seven Wonders of the World. According to a votive inscription by the Lacedaimonians, the temple was built around 456 B.C. and is an excellent sample of the Doric order. To the north there is an older temple, dedicated to Hera. This temple must have been built around 600 B.C., dedicated to the sanctuary of Olympia by the people of Scillountas, an ancient town in Ilia. The temple held one of the sanctuary’s most significant and valuable works, Hermes by Praxiteles. Only part of the temple has been preserved today, while some fragments are kept at the Archaeological Museum of Olympia. There is also the Mitroon, a temple dedicated to Rea-Cybele, the mother of gods, and behind it the treasures erected as offerings by the Greek cities and colonies. To the west stands Nymfaion, an aqueduct that Herodes Atticus dedicated to the sanctuary. There was also the Phlippeion, an offering by Philip II, the Prytaneion, the Pelopion, as well as many altars, busts and statues. 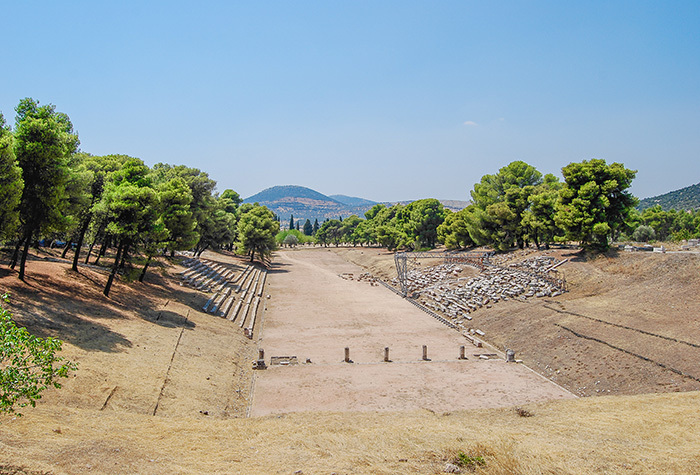 Outside of the Altis there was also the Bouleftirion, the South Stoa, the Gymnasium, where the athletes trained, the Palaistra, Phidias’ workshop, the Baths, the Leonidaion, Nero’s mansion, and of course the Stadium, where the Olympic Games took place, with a capacity of 45,000 spectators. This Museum is one of the richest and most important museums in Greece, and it hosts the findings that the excavations at the ancient site of Olympia brought to light. 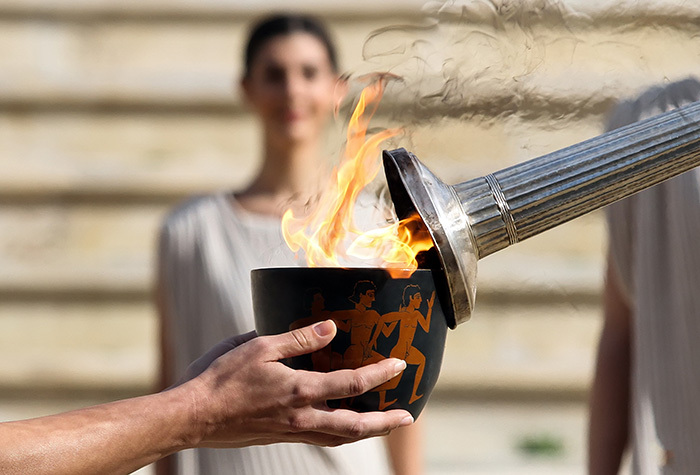 It includes the largest collection of copper artifacts in the world, as well as collections of sculptures, ceramics and various artifacts connected to the Olympic Games. Among the most significant findings are the famous Hermes by Praxiteles, Nike by Paionius, the helmet of Miltiades and the complex of Zeus and Ganymede.